Petrochemical-derived products such as carbon black, solvents, resins, mineral oils, and intermediates are used as key raw materials in the production of flexographic inks. Flexographic printing is an important printing process used in flexible package printing. Its popularity can be attributed to its high versatility in terms of printing on a wide range of substrates. Flexographic inks exhibit high adherence to the substrate surface and offer excellent printing quality, irrespective of the material of the substrate. Packaging is considered a highly important aspect of marketing, which influences the consumer’s purchasing decision. The packaging industry is a major consumer of printing inks. Growth of the food & beverages sector and increased demand for flexible packaging from the health care sector are expected to boost the demand for flexographic inks in the next few years. The trend of e-commerce is growing at a significant rate across the globe. It is hampering the publication & commercial printing industry. Thus, a substantial decrease in paper-based communication is estimated to restrict the global flexographic inks market during the forecast period. The trend of e-commerce comprises e-books, event tickets, sporting goods, toys, and hotel and airline reservations. Especially, rising adoption of e-books is anticipated to hamper the global flexographic inks market during the forecast period. In terms of type, the flexographic inks market has been segmented into solvent-based inks, water-based inks, and UV-cured inks. In 2017, the water-based inks segment held the leading share of the global market. Water-based flexographic inks contain water as its major constituent along with glycol. These inks are more eco-friendly than solvent-based flexographic inks. Globally, the demand for water-based flexographic inks is rising due to stringent regulations related to the environment. On the other hand, UV-cured inks do not contain any volatile compounds and, therefore, they are used in various printing applications such as gravure, inkjet, and flexography printing. They offer several advantages over the conventional printing inks. Demand for VOC-free printing inks is gaining momentum, due to increased number of regulations imposed on the usage of inks emitting VOCs. Furthermore, strict monitoring of usage of toxic chemicals, which possess high vapor pressure at room temperature, and government investments in the renewable energy sector are anticipated to drive the demand for UV-cured flexographic inks in the next few years. In terms of application, the flexographic inks market has been classified into packaging and others. The others segment comprises newspapers, magazines, and journals. The packaging segment has been sub-segregated into flexible packaging, corrugated containers, folding cartons, tags & labels, and others. In 2017, the packaging segment held the leading share of the global market. The packaging industry is a major consumer of printing inks. Rise in the demand for flexible packaging in the food & beverages industry led by lower weight and better aesthetic packaging is anticipated to fuel the packaging segment of the global flexographic inks market during the forecast period. This, in turn, is estimated to propel the global market for flexographic inks in the near future. In 2017, the flexible packaging sub-segment dominated the packaging segment of the global flexographic inks market, followed by the corrugated containers sub-segment. Flexographic inks are most commonly used in applications such as corrugated containers and flexible packaging, with the latter being largely employed in the food & beverages industry. Flexographic inks are also used in cartons, folds, labels, and newspapers. In terms of region, the global flexographic inks market has been classified into North America, Europe, Asia Pacific, Middle East & Africa, and Latin America. In 2017, Asia Pacific accounted for a major share of the global market. Rise in the demand for packaging in food & beverages and personal care industries to achieve better aesthetic packaging in Asia Pacific is expected to boost the packaging segment of the market in the region during the forecast period. China, India, and Japan collectively constitute a major share of the flexographic inks market in Asia Pacific. The market in the region is expected to expand at a more rapid rate than the market in other regions. Both North America and Europe are actively investing in the development and manufacture of VOC-free inks to comply with government regulations. Thus, the demand for UV-cured inks in these regions is expected to increase substantially in the next few years. In terms of resin, the global flexographic inks market has been segregated into nitrocellulose, polyamide, polyurethane, acrylic, and others. Out of these, polyurethane is the most commonly used resin, as polyurethane-based flexographic inks can be used with plastic packaging such as flexible packaging, folding cartons, tags, and labels. As plastic packaging is widely used, so is polyurethane as a resin. This trend is expected to continue during the forecast period. The global flexographic inks market is moderately consolidated, with a few multinational companies holding a key market share. Key manufacturers of flexographic inks include Altana AG, Zeller+Gmelin GmbH & Co. KG, Flint Group, Sun Chemical Corporation, and INX International Ink Co. This report analyzes and forecasts the flexographic inks market at the global and regional levels. The market has been forecast based on volume (kilo tons) and revenue (US$ Mn) for the period from 2018 to 2026, considering 2017 as the base year. The study includes drivers and restraints of the global flexographic inks market. It also covers the anticipated impact of these drivers and restraints on the demand for flexographic inks during the forecast period. The report also highlights opportunities for the flexographic inks market at the global and regional levels. The report includes detailed value chain analysis, which provides a comprehensive view of the global flexographic inks market. Porter’s five forces model for the flexographic inks market has also been included to help understand the competition landscape of the market. The study encompasses market attractiveness analysis, wherein type, application, and resin segments have been benchmarked based on their market size, growth rate, and general attractiveness. 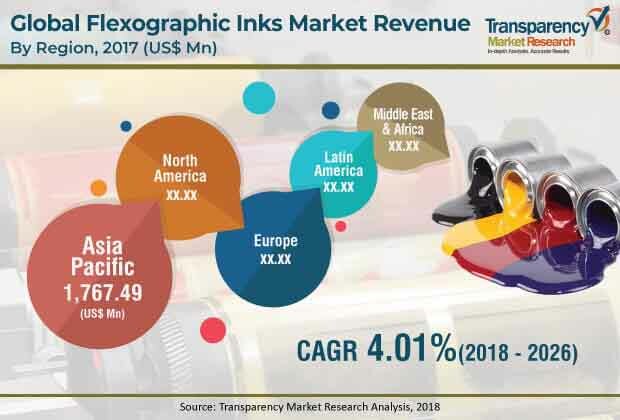 The study provides a decisive view of the global flexographic inks market by segmenting it in terms of type, application, resin, and region. In terms of type, the market has been segmented into water-based, solvent-based, and UV-cured. Based on application, the market has been segregated into packaging (including flexible packaging, corrugated containers, folding cartons, tags & labels, and others) and others. These segments have been analyzed based on the present and future trends. Regional segmentation of the global market includes the current and forecast demand for flexographic inks in North America, Europe, Asia Pacific, Latin America, and Middle East & Africa. The report provides size (in terms of volume and value) of the flexographic inks market for the base year 2017 and the forecast for the period between 2018 and 2026. Market numbers have been estimated in terms of type, resin, and application segments of the flexographic inks market. Market size has been provided for the global, regional, and country-level markets. The report comprises profiles of major companies operating in the global flexographic inks market. Key players operating in the global market are Altana AG, Zeller+Gmelin GmbH & Co. KG, Flint Group, Sun Chemical Corporation, INX International Ink Co., and Toyo Ink SC Holdings Co. Ltd. Market players have been profiled in terms of attributes such as company overview, financial overview, business strategies, and recent developments. Flexographic inks are manufactured by using petrochemical-derived raw materials such as resins, carbon black, mineral oils, solvents, and intermediates. Flexographic inks are used in the flexographic printing process, which is commonly employed in flexible package printing. The popularity of flexographic printing can be attributed to the fact that it can be used on a wide range of substrates. Among types, the global flexographic inks market is dominated by the water-based segment. Water-based flexographic inks are preferred due to their low price and eco-friendly properties. Among applications, the market is dominated by the packaging segment. Flexible packaging and corrugated containers sub-segments dominate the packaging segment. Among resins, the market is dominated by the polyurethane segment, closely followed by the polyamide segment. Polyurethane resins are preferred, as they can be used with a wide range of plastic packaging applications.